Wannacryonclick Ransomware is already inside your system if a disturbing window “Oops, your files have been encrypted!” has been opened on your screen. Although this infection is not as harmful as similar threats, it is still called a ransomware infection because it demands money from victims. There is no point in sending cyber criminals money, believe us, because Wannacryonclick Ransomware has not encrypted a single file on your PC. If you have encountered a new version encrypting data, you should not send money to malware developers either because the possibility is high that you will not get your files unlocked. No matter what ransomware infection you encounter, you must delete it from your system as soon as possible. Once the malicious application is gone from the system, you could try out available free data recovery methods to get, at least, some personal files back. Most probably, you will not need to do anything after the Wannacryonclick Ransomware removal because this infection does not encrypt any files at the time of writing, specialists working at pcthreat.com say. 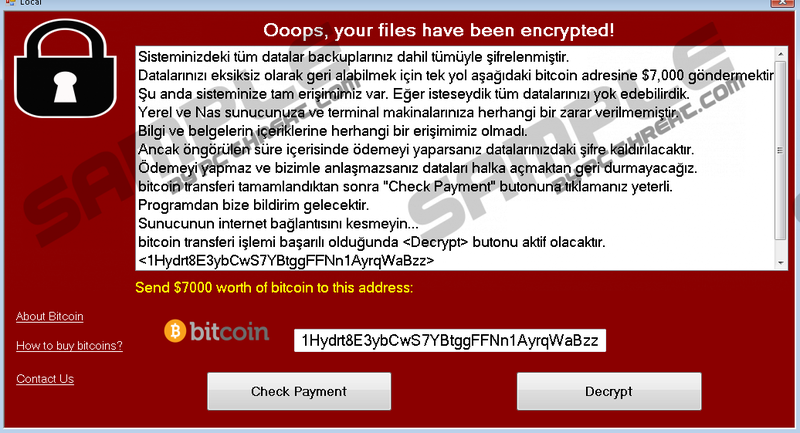 Although all users can encounter Wannacryonclick Ransomware, it seems that it targets Turkish-speaking users mainly because the message opened for victims after its successful entrance is almost entirely in Turkish. They are told that their all files, including backups, have been encrypted, and the only way to unlock the encrypted data is to send $7000 in Bitcoin to the provided Bitcoin address. Users also find out that they could download the decryption tool by clicking the Decrypt button right after sending the ransom to cyber criminals behind Wannacryonclick Ransomware. As has already been told in the first paragraph of this article, this malicious application has, most probably, not encrypted your files despite the fact that you see a window opened on your Desktop claiming that the encryption of files has already occurred. As a consequence, there is no point in paying a ransom either. What we expect you to do is to fully remove the ransomware infection. You cannot let it stay even if it has not encrypted any of your personal files because it might get updates from its C&C server one day and then lock files stored on the system without mercy. The information provided in the last paragraph of this article will help you to get rid of it fully. Wannacryonclick Ransomware is not a very popular infection, so specialists do not know much about its distribution either at the time of writing. The only thing they are sure about is that this threat should be mainly distributed via spam emails. Ransomware infections do not enter systems when spam emails are opened. They can only end up on users’ PCs when users click on a malicious link provided or open an attachment. Since Wannacryonclick Ransomware does not lock files and does not drop any files on affected systems, the only symptom showing that this malicious application is active on the system is the red window with a padlock in the top-left corner opened on Desktop. If this ransomware infection has entered the system successfully, it means that other infections might show up on the system easily too. They might be much more harmful if compared to Wannacryonclick Ransomware, so you should do what it takes to ensure the system’s maximum protection. Go to take action right after the removal of this threat! Actually, there is only one thing you need to do – install a security application on your PC. It is not enough to install it – update your security software periodically and keep it active 24/7 on your computer. You should not find the Wannacryonclick Ransomware removal very complicated because this threat does not drop any additional files, it does not lock Desktop, and it does not block Task Manager, Registry Editor, or other utilities. The only victims’ task is to find and delete all suspicious files from the system. These files might be located anywhere, but you should check first %USERPROFILE%\Downloads and %USERPROFILE%\Desktop. These are two directories where suspicious files are usually located. If you cannot find any suspicious/malicious files associated with the ransomware infection, scan your PC with an automated malware remover. It will clean the system for you quickly. The best thing about these automatic tools is that they delete active malicious threats all at once. Open Explorer by tapping Win+E. Go to %USERPROFILE%\Downloads and %USERPROFILE%\Desktop. Quick & tested solution for Wannacryonclick Ransomware removal.